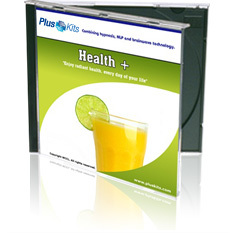 PlusKits.com - The Ultimate Healthy Immune System And Total Body Health Hypnosis NLP CD. Want to keep your body fit and healthy? Need a natural method that you control from the inside out? Let Health + help you achieve total and perfect health the easy way! No more pills, potions or prescriptions. Health + uses the most advanced scientific techniques to help you change the way you think and fight off illness and infection. Through a combination of NLP, hypnosis and brainwave stimulation, Health + will have you feeling healthy, thinking positive and looking great in no time. Simply sit back and listen as the soothing musical soundscapes help you relax and re-energize your body from within. How long does it take to achieve a perfectly healthy body? With Health + you’ll start to feel the benefits in less than 60 minutes. Old habits will fade away as you learn to get your mind and body working together for your well-being. • Feel better than ever. • Keep illness and infection at bay. • Enjoy the benefits of a healthy mind and body. Purchase Health + TODAY and give your immune system a helping hand! We guarantee you’ll love this recording. That’s why we’re backing up our promises with a risk-free NO QUESTIONS ASKED 100% customer satisfaction guarantee. If you’re not in any way happy with this product, return it within 90 days and we’ll refund your entire order. Click here for details. Buy any product from our site before midnight, Thursday, and you’ll receive the FREE bonus session, Borrowed Genius™! Discover how to instantly think like some of the leading role models of our time – Artists, Inventors, Presidents & more. It’s EASY when you use Borrowed Genius™. And this FREE gift is all YOURS – when you purchase TODAY! RRP $195.